NIA CHARLESTOWN NEVIS (June 23, 2016) — Director of the Nevis Disaster Management Department (NDMD) Brian Dyer says the first of a number of sub-projects under the St. Kitts and Nevis Human Resource Development Sector Project, funded by the Basic Needs Trust Fund (BNTF) programme, has improved the island’s level of preparedness in the workplace. Dyer made the comment in an interview with the Department of Information on June 23, 2016, on the heels of a two-day workshop on June 14-15, 2016, for civil servants and shelter managers entitled Disaster Risk Mitigation Practices Project. 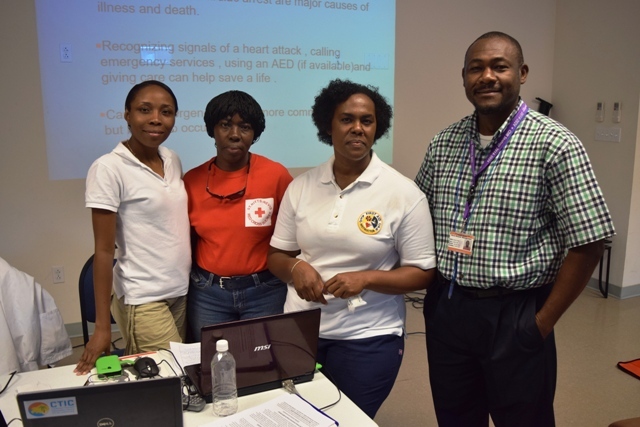 It was held in collaboration with the local Red Cross branch and focused on First Aid and cardiopulmonary resuscitation (CPR). “It went well. We had 15 participants on the first day for shelter managers and 20 civil servants on the second day. It has enhanced our level of preparedness in the work place and by extension in the communities,” he said. According to the disaster management official, a number of other initiatives are planned through to October under the BNTF-funded project. A second workshop for civil servants will target occupational health and safety. Other projects include a School Emergency Response Team Training and a Multi-Media Campaign. Dyer explained that the training targeting schools is intended to develop an emergency response team to strengthen school safety. However, the media campaign will assist with community awareness and education. It will entail a multi-hazard survival guide and tsunami evacuation plan, including maps and assessing the community’s readiness. He said a number of surveys will be conducted to assess the community’s readiness and signs displaying assembly points and evacuation routes in the event of a tsunami will be erected in strategic areas. 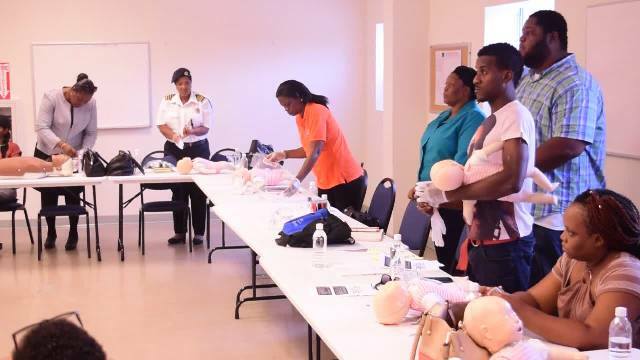 Meantime, Red Cross instructor and health educator Nurse Roxanne Brookes who led the first training session said the overall objective of the training session was to teach persons what they should do in case of emergencies until medical help arrives and takes over. The topics included: How to respond to drowning incidences; road traffic accidents; how to move an ill or injured person and this is very important, especially as it relates to road traffic accidents; and sudden illnesses in the work place, if someone suddenly collapses what can a co-worker do until medical help arrives or until you get that person to emergency services. “When we teach First Aid, it is not just for the particular group… When we train, the objective is that in the case of any incident, in the case of a natural disaster, that our community is so well prepared, that they are equipped until medical help is available until the infrastructure is back up or until external forces, if necessary, come in to help us. “The importance is building capacity within our different communities in the workplace, schools, etc.,” she said.